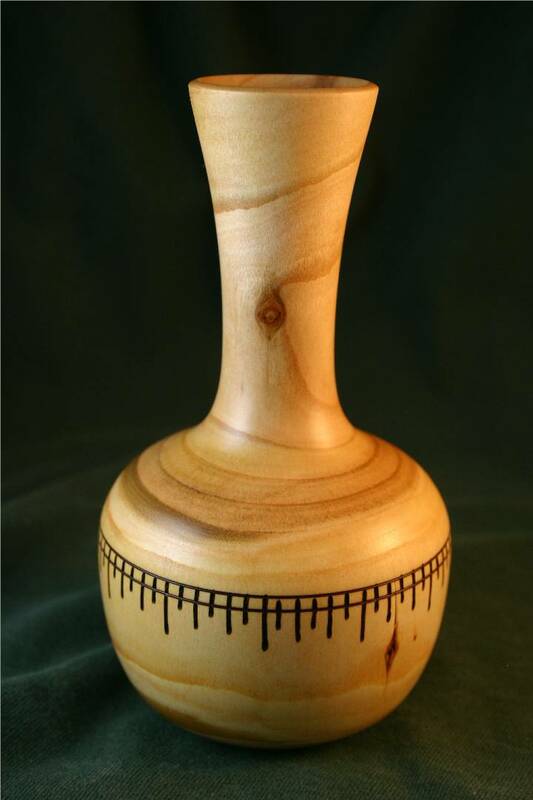 This vase is around 5 inches tall, and is made from a small cherry log. There is sapwood around the outside of the base that will remain light, and heartwood jutting up from the base to the top that will darken with age. This is the first hollow vessel I've ever tried. It turned out fairly nice. It's made from a cherry log that had 5 or 6 branches sticking out of it. I turned it while it was still very green, and finished it in one session. As it dried, the knots developed small cracks, and the vase distorted a bit. It's got great character. It's mostly sapwood, with heartwood jutting up from the shoulder. It's about 8" tall and 5" in diameter and the wall is less than 1/4" thick. 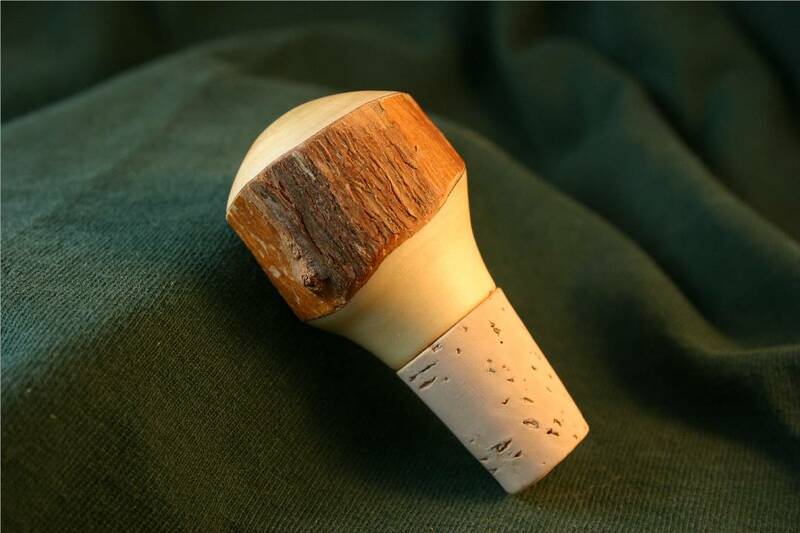 Here's a stopper I made for a friend that tore a branch off a rhododendron and gave it to me at a party at his cabin. The branch was fairly small, so I left the bark on it for a rustic look. 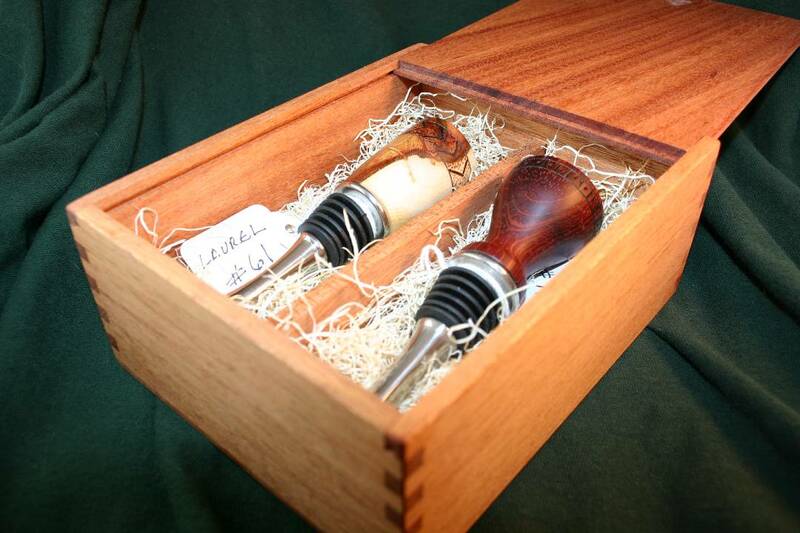 I made several of these gift boxes to hold two bottle stoppers each. 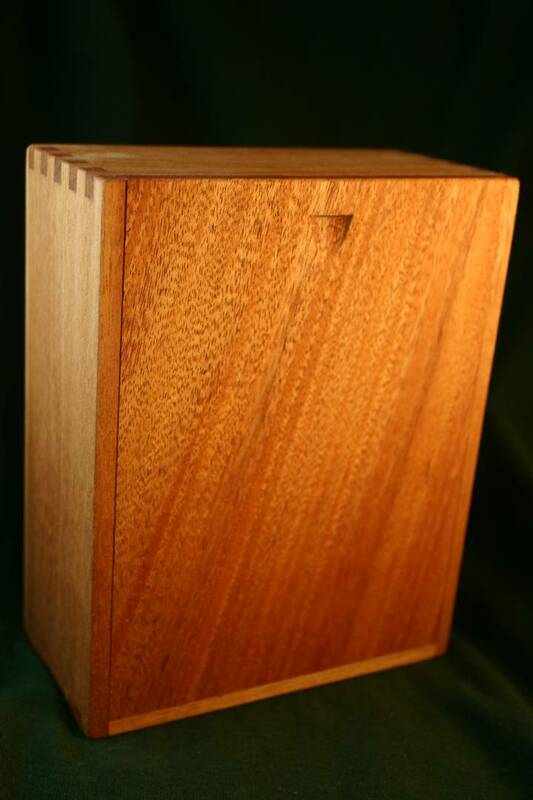 They are made from African Mahogany, with a divider in the center and packed with excelsior to cradle the stoppers. The lid is precisly fit and slides open to reveal the stoppers. On the corners of the box, you can see I used what are called box joints to hold it together. 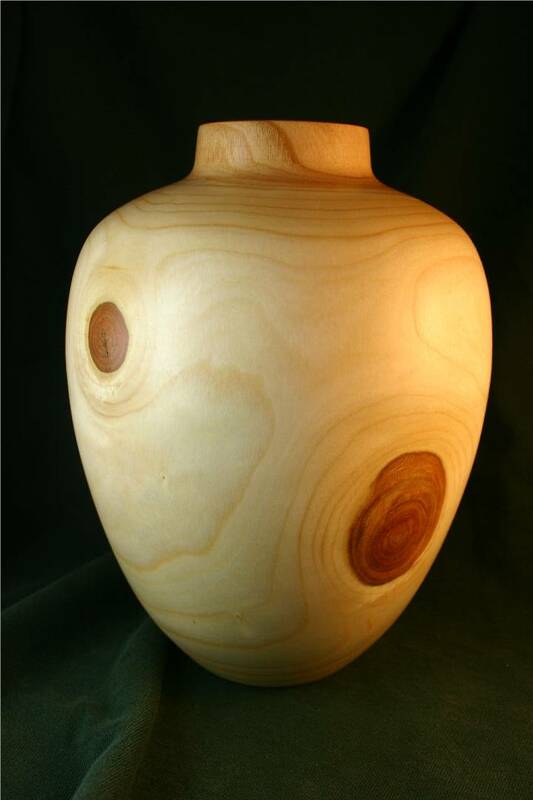 This vase is made from a clear piece of cherry log. The creamy sapwood surrounds the piece and the darker heartwood can be seen at the bottom and top. It's around 9" tall, and 5" in diameter with a wall thickness less than 1/4" thick. 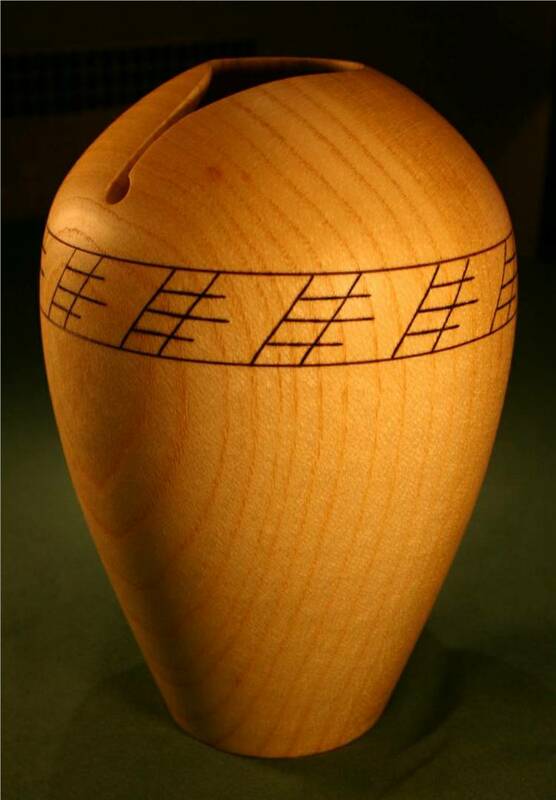 I used a guitar string and a wood burning pen to embellish the vessel with a unique pattern. 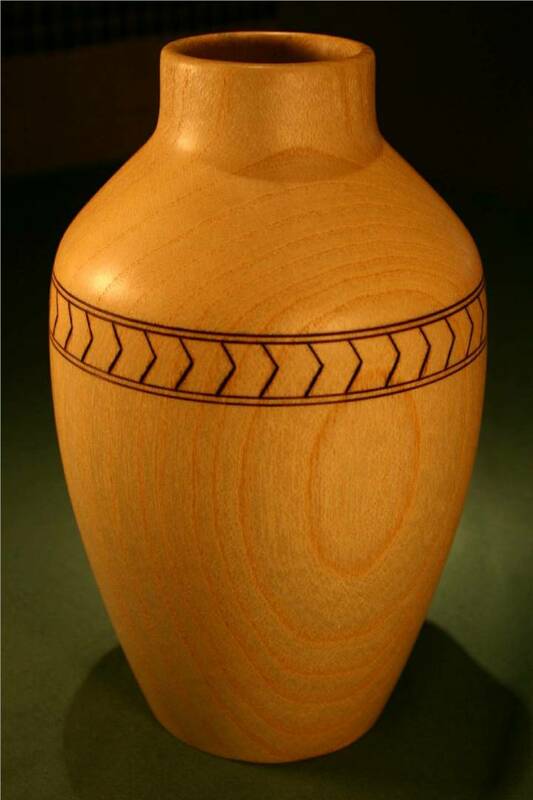 The vase is made from ash. It is around 8" tall and 5" in diameter with a 1/4" thick wall. 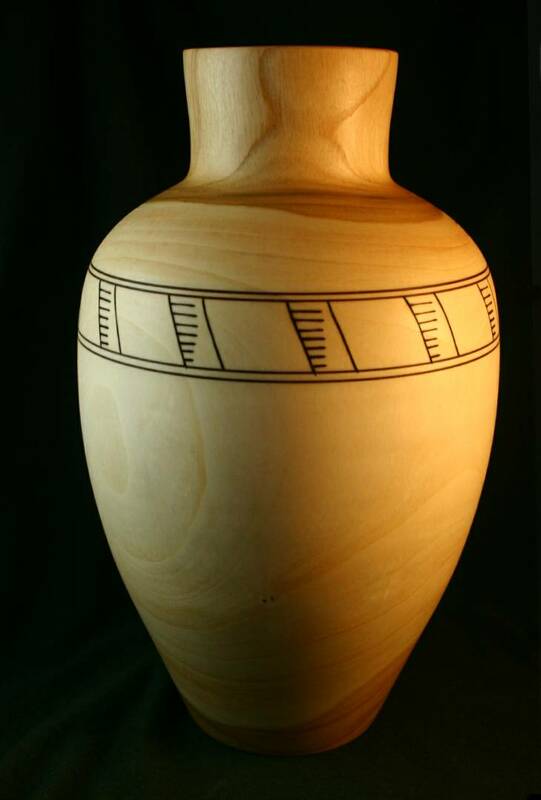 I carved a unique shape into the mouth of the vase and burned a pattern into the shoulder to add a little character. This is another hollow vessel made from ash. It is about 8" tall with a wall thickness of less then 1/4". I burned a chevron design around the shoulder. It is silky smooth and finished in Danish oil and paste wax.